WARNING: The Earth contains Oxygen, Water and Carbon, all of which can kill you if you try hard enough. Be sure to wear flowers in your hair. Is that tie dye underwear in your soup and/or salad? Warning: the chemicals use to make tie-dyed underwear can cause birth defects in the wearer. Warning: No one gets out alive. You may want to watch that sign also. It looks like it's leaning. If you get knocked on the head by a warning sign can you still sue? I'd be more worried about the San Andreas Fault. Cindy! Annie! I just found out about your secret cabal. Well, I'll show you! I'm going to start the Brown-Headed league, and we won't invite you. Now don't you just want to eat and drink something there. *pats Elon on his little brown-haired head* It's okay Elon. We can't all be special. I hear they have GALLONS of dihydrogen monoxide in that place. Dave is obviously researching materials for a possible book: "Dave Barry Dines at McDonalds". Don't worry about the San Andreas fault. They're going to rename it in honor of George W. Bush. That way, when the Big One hits, it will be Bush's fault. Put the two craziest States together and you'll have a State called Califlorida. I'd like to see the scary sign for THAT one! Consumers are advised to avoid consumption. According to wikipedia, the warning is due to acrylamide, a chemical naturally present in cooked food and in olives. The smog will get you first. dihydrogen monoxide caused thousands of deaths in Japan. It needs tobe banned NOW! Dihydrogen monoxide is an addictive substance and must be banned. Just try going without it a few days. 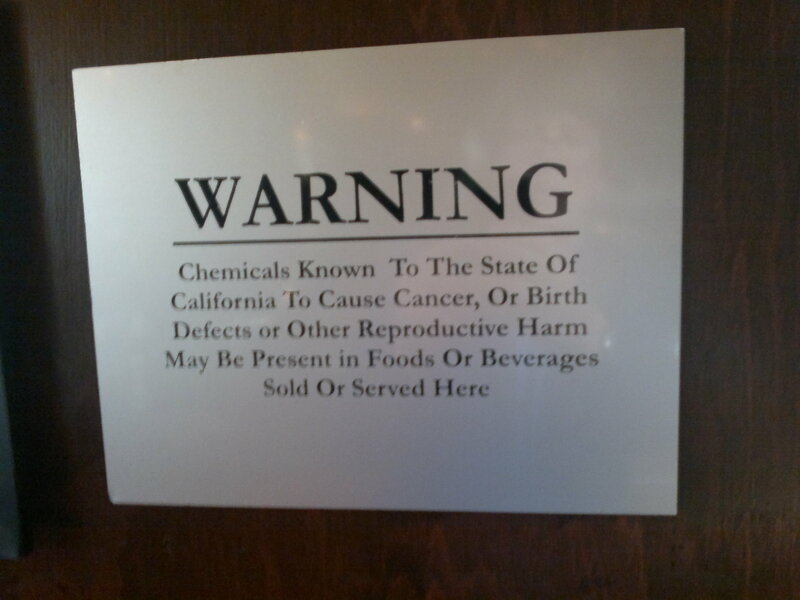 The warning sign I would love to see is "Warning, California is hazardous to taxpayers." Yes Mikey and EyeGore, and you didn't even point out that in its solid form dihydrogen monoxide causes thousands of auto and pedestrian accidents every winter, some of them fatal. Shouldn't they have similar signs in public toilets about dysentery, cholera, etc. ? If we have much more dihydrogen monoxide show up in this area we're going to drown. Just like the signs in Clifornia bars. "The State of California has determined that consumption of alcohol may cause..."
Really? The State of California determined this? So all these years those scientists have just been doing busy work? Dihydrogen monoxide in its gasseous state can cause severe burns. How does the gubmint permit this stuff to exist?? And don't get me started on why you can smoke weed in church in California but I'll get life in prison if I walk down the street with a lit cigarette. "The State...has determined..." Yeah, I've heard that one before. We were in a class learning about a new regulation we were supposed to enforce. I asked the moderator who wrote the regulation? I said, "The Cabinet is a building and it didn't write squat. What is the name of the person who wrote this?" "Because," I said, "it's easier to cuss someone when you know his name." Highly paid busywork, Lazeeboy. Why do you think this state is bankrupt?